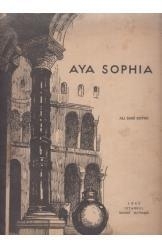 Aya Sophia and its history by Ali Sami Boyar, the curator of the Aya Sophia Museum in Instanbul and illustrated by the author. Album format, 18 pages with text, color and black and white photographs, maps and floor plans. The color photographs have tissue paper protecting them.